The Rolling Stones are a band for 55 years in 2017. A life long career in rock music is no longer a hypothetical question. We know it can be long, last a lifetime and be very lucrative for those at the top. Did the band's latest release, 'Blue & Lonesome' give off the suggestion of a time machine with all the fine blues The Rolling Stones played on it, this release is a time machine. 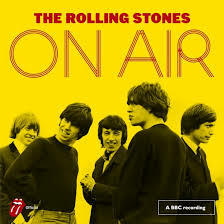 20 Years after it became fashionable to do so finally The Rolling Stones releases its BBC recordings made in the mid 60s. What I hear is the nucleus of the band that grew to monstrous proportions with the climb of the decades. This is what it used to be all about: Have a great song and perform it as a five piece. This, in part, is Brian Jones' band, the band that played rock and roll and rhythm and blues covers from the U.S. and caught that energy for the babyboomers if the U.K. about to embark on their peace and love adventure. The picture on the cover already shows the true configuration of the band. In my opinion it is no coincidence that this picture shows Mick, Keith and Charlie most in the front. Then Bill Wyman and only then Brian Jones. Almost falling of the picture, semi-faded out already. That apart, what a joy On Air is. It lets me hear what I wasn't present at, all that passed me by. The Rolling Stones were as raucous as I would have expected them to be. Listening to these recordings it is almost imaginable how dangerous the U.K. establishment must have perceived youngsters who make music like this. The sound is dirty, gritty, Jagger sneers in his singing. He's not as good yet as he'd become, but catches the time with voice and demeanour. It all starts with the first hit 'Come On' from 1963. A more obscure Chuck Berry song, released by the Stones and made famous forever because of it. We hear a tight band, playing a small song. There is nothing more than there was in these studios where the song were recorded. Some with audiences, some without. Giel Beelen's Speelplaats in the 60s. This band was good. It had this fired up energy and an interaction between the individual members that made them more than a five piece band. The Stones captured the hearts and minds allowing for a basis that got them where they are now. Rock Gods. 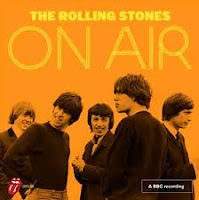 If anything On Air shows the process the band went through: from covers, to covers that were slowly reworked into Stones songs and then come their own hits. Many of the songs still are covered by bands right up to this day. There's is one complaint and it is serious: Why just slab these songs on the record instead of showing the development of the band chronologically? That would have made sense. This isn't the nth hit compilation that needs a reshuffle. This is historical song mining. An inexcusable laps in my opinion, simply because the development the album shows goes somewhat missing. Whether we had to wait so long, because the band waited for Alan Klein to die, who held the rights to some of these songs (and perhaps these recordings?) or there's another reason, I don't know. Let's just enjoy what we were finally, officially, given.